It was a brisk morning on Saturday the 2nd of December that CUH&H piled onto a coach to head to Wimbledon Common. Following the close series of races at Shotover, Oxford a week prior to the Blues match, CUH&H had shown that they had a good term of training behind them and that the contest at Wimbledon Common would be a close one. Several hours and a couple of formal photos later, the races got underway with the “Old Blues/ Gits” competition. The ‘Old Gits’ race saw Cambridge take the victory. Recent alumni Alex Short and David Wilson taking first and second led the team home, with Cambridge packing in throughout the field. On a 12 to score points system, Cambridge convincingly took the win with the points totals 123- 181. First woman home was Cambridge’s Katy Hedgethorne who put over a minute into the second woman, another Cambridge runner, Sarah Lovewell. Next up was the women’s race, a victory expected to go convincingly to Oxford. 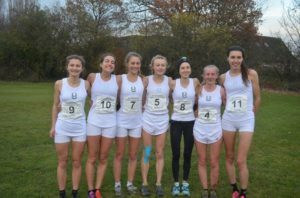 Although the end result did indeed see Oxford taking the win, strong performances from the whole of the Cambridge women’s team meant that the race was by no means a white (dark blue?) wash. Battling with the lead group to finish 2nd, Niamh Bridson Hubbard led the Cambridge side home, supported by strong performances from fresher Nancy Scott in 5th and Ruby Woolfe in 6th. Club Captain Lizzy Apsley put in a resilient run to earn her 3rd successive blue to finish 9th. The scoring team was completed by Rachelle Falloon on her Blues match debut, coming in 3 behind Lizzy to finish 12th. For a young team, the performance in this year’s Blues match bodes well for future years and performances in competitions after Christmas. Coming into the 2017 season, the men’s Blues race promised to be something exciting after CUH&H and OUCCC finishing 3rd and 4th respectively at BUCS. With changes to teams on both sides and a degree of uncertainty surrounding form, the race promised to be close and exciting, and it did not disappoint. Throughout the race, the lead changed regularly with frequent overtaking and tactical running. Although unfortunately, the Cambridge men’s side could not put in a repeat performance of last year, narrowly losing out 41-37, the team put in some excellent performances. Leading home the light blue side was last year’s winner Oliver Fox in 2nd, only just losing out on a second victory in a final sprint for the line. He was closely followed by George Gathercole in 3rd, a performance demonstrating the huge improvement he has made this season after finishing 9th the previous year. Will Ryle- Hodges was next in, after a great race to finish 5th. 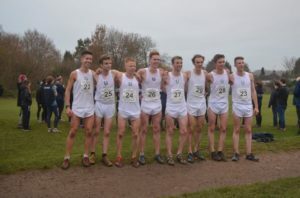 Running his first Varsity match, Paul Aste finished 9th with Captain MacGregor Cox just behind in 10th, again showing a dramatic improvement on the previous year’s performance. Completing the team was Phillip Crout, who ran bravely despite falling in the challenging “Butts” section of the course. Christmas, training begins again in January, with a camp in the South Downs. The next opportunity to take down Oxford comes in the BUCS cross country in February. Until then, no doubt a lot of miles will be run.